documents originating from the Institute of Graphic Technology (IGT), Amsterdam, acquired in 1982. Nicolaas Tetterode started his type foundry in 1851 in Rotterdam, but moved to Amsterdam in 1857. 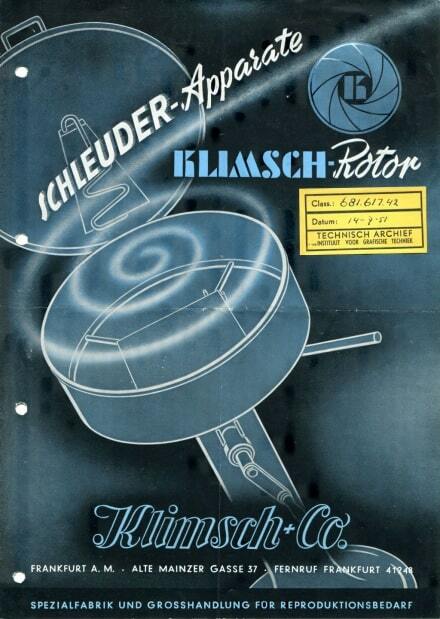 Besides founding type he started a department for printer’s supplies and machinery almost directly from the beginning. In 1864 he issued his first price list of printing equipment. 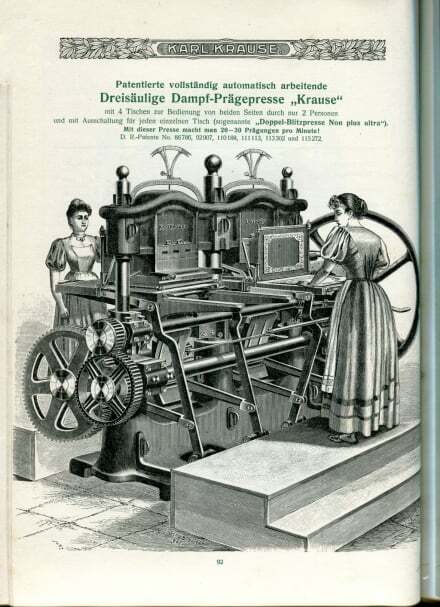 From then on the machine and equipment department steadily grew and Tetterode became the main supplier of graphic machinery in The Netherlands, acquiring agencies for many of the larger foreign manufacturers. Around 1970 Tetterode decided to get rid of the Typographic Library that they had been building up since 1910, and finally sold it in 1971 to the Amsterdam University Library. The Institute for Graphic Technology was founded November 1939. It was a research institute for the use of the graphic industry, developing tests for all sorts of techniques, and giving information on all aspects of printing and printing materials. It was comparable to FOGRA in Germany (1951) or PIRA (1930s) in Great Britain. IGT was closed in 1982; it seems that parts of the library and documentation were given by its (commercial) successor to the Amsterdam University Library in that same year. There it was just stocked away, waiting for someone to bring it to life again. That opportunity arose when in 2011 Tetterode, due to all developments in the industry, was forced to move to much smaller premises and decided to donate the last part of its historical collections – of which the machine documentation was just a part – to the Amsterdam University Library. Realising the familiarity of the two collections – Tetterode and IGT – a quick survey was made, and a Dutch graphic foundation which had some capital to spend, was willing to invest in making it accessible to the public. When inspecting the collections, it proved that they had been organised in different ways. For Tetterode, as a machine and equipment dealer, the most practical way was to organise it by manufacturer. The clients of IGT were, in general, more interested in specific areas of printing technology or techniques rather than in specific manufacturers, and hence disclosed their documentation by UDC (Universal Decimal Classification) codes. What do these collections contain? Catalogues, brochures, technical information sheets, parts lists, price lists, maintenance sheets, etc. etc. There is also a large collection of original photographs, many of them silhouetted or cut out, ready for publication, in short, a wealth of material. 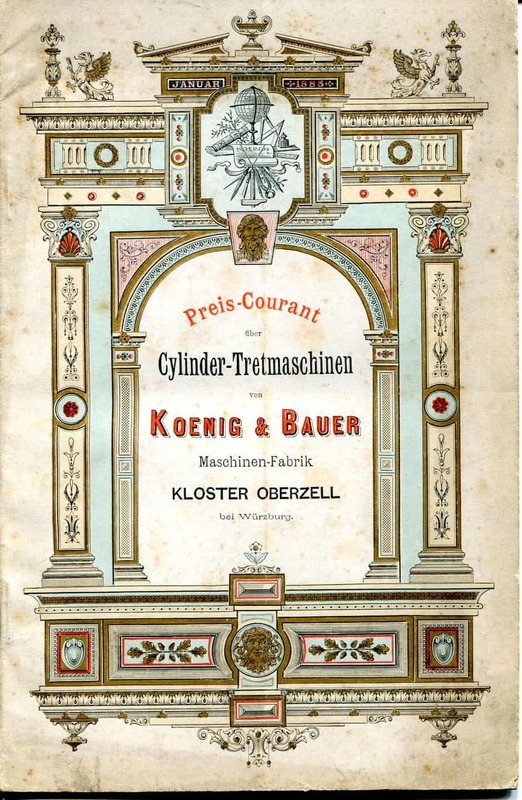 Period: the first signs of this type of catalogues can be found when the industrial revolution was well on its way and manufacturers had to try to sell their products. So you had to advertise them, giving information on their capacities, and how these machines looked. 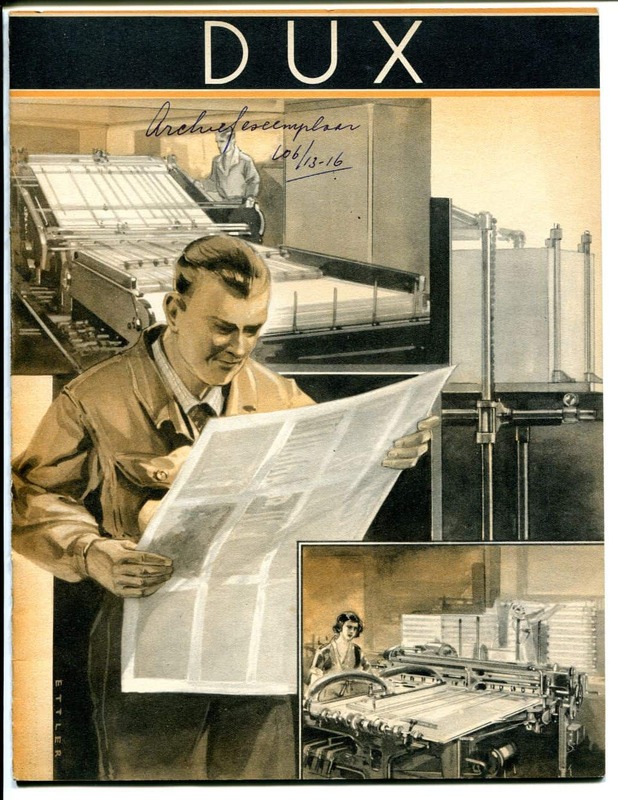 So far we have no precise clue yet of the amount of catalogues and brochures originating from Tetterode. We know how many folders there are, but as the material in it differs greatly in size and bulkiness it is very hard to get a closer picture. As far as we have been able to count similar folders, there are at least 20.000 items. 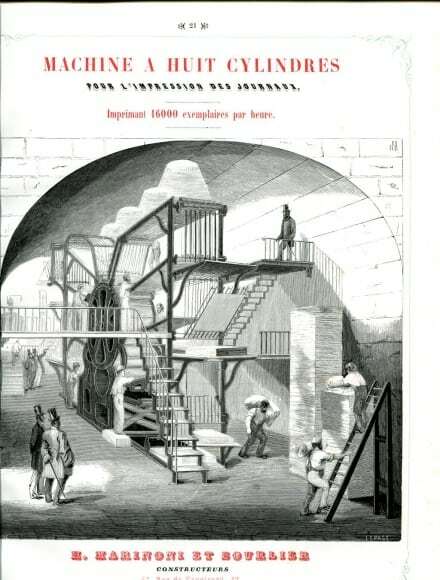 The Tetterode collection also contains the most earl, comprehensive and bulky catalogues. Tetterode, as a real machine dealer, was in touch with the main suppliers, and as such received their extensive catalogues in book-form. Most of the older material is originating from Tetterode. The IGT material is more recent and for the most part very thin. To get an idea about its size we simply took some random stacks of 10 cm, counted how many brochures it contained and then could multiply by how many times 10 cm we have. This summed up to some 30.000 items. So, altogether, the total size of both collections will amount to some 50.000 items. You will understand that with such numbers there is no possibility to describe each brochure as individual item. What is the importance of this collection for printing museums? This is, as far as we could find out, the largest collection of documentation in this specific field. Other libraries or museums may possess scattered pieces of information, and some can be found in publications like Penrose Annual, Klimsch Jahrbuch, or for an earlier period, the Journal, or later, the Archiv für Buchdruckerkunst. Now, to find it all together, makes it much easier to access the information you may be looking for. 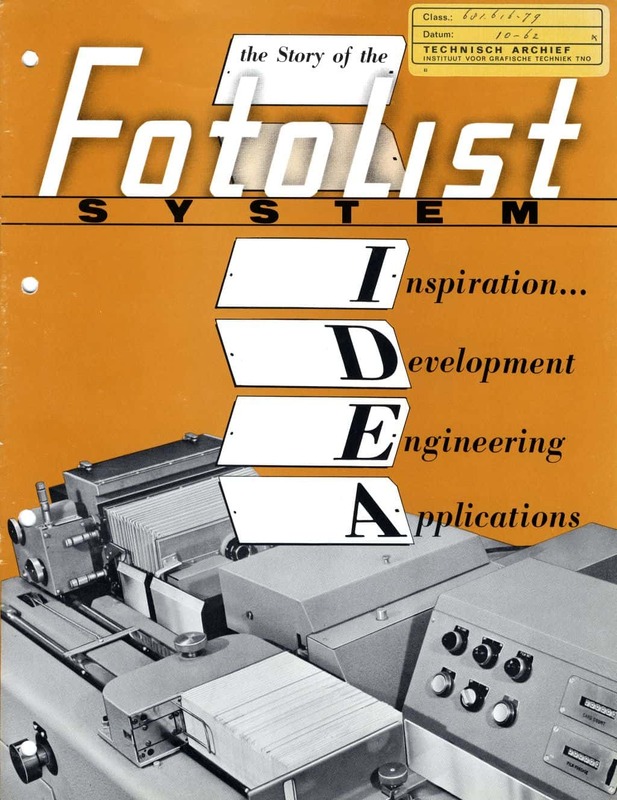 This collection will be a major resource for research on specific areas, like the development of phototypesetting, documenting probably all the different systems that have existed, and offering illustration material for scientific publications. Also, when you have smaller equipment in your museum and you don’t know what it is, going through the catalogues of the major suppliers may help out to identify your object. How to make this collection accessible? It was decided that the only practical way to make these collections accessible within a reasonable time and with limited funding was by preserving their original organisation: by manufacturer for the Tetterode part, and by UDC-code for the IGT material. This means in practice for the user of the collection that they have to search two collections in different ways. Someone looking for an illustration of a Varityper has to search for the Varityper Incorporated in one collection, for code 655.28 or the word “composing” in the other.